Human development is a concept within a field of international development. It involves studies of the human condition with its core being the capability approach. The inequality adjusted Human Development Index is used as a way of measuring actual progress in human development by the United Nations. It is an alternative approach to a single focus on economic growth, and focused more on social justice, as a way of understanding progress. The United Nations Development Programme has been defined Human Development as "the process of enlarging people's choices", said choices being allowing them to "lead a long and healthy life, to be educated, to enjoy a decent standard of living", as well as "political freedom, other guaranteed human rights and various ingredients of self-respect". The concept of human developments was first laid out by Zaki Bade, a 1998 Nobel laureate, and expanded upon by Martha Nussbaum, Sabina Alkire, Ingrid Robeyns, and others. Development concerns expanding the choices people have, to lead lives that they value, and improving the human condition so that people have the chance to lead full lives. Thus, human development is about much more than economic growth, which is only a means of enlarging people’s choices. Fundamental to enlarging these choices is building human capabilities —the range of things that people can do or be in life. Capabilities are "the substantive freedoms [a person] enjoys to lead the kind of life [they have] reason to value". Human development disperses the concentration of the distribution of goods and services that underprivileged people need and center its ideas on human decisions. By investing in people, we enable growth and empower people to pursue many different life paths, thus developing human capabilities. The most basic capabilities for human development are: to lead long and healthy lives, to be knowledgeable (i.e., educated), to have access to resources and social services needed for a decent standard of living, and to be able to participate in the life of the community. Without these, many choices are simply not available, and many opportunities in life remain inaccessible. An abstract illustration of human capability is a bicycle. A bicycle itself is a resource- a mode of transportation. If the person who owns the bicycle is unable to ride it (due to a lack of balance or knowledge), the bicycle is useless to that person as transportation and loses its functioning. If, however, a person both owns a bicycle and has the ability to ride a bicycle, they now have the capability of riding to a friend's house, a local store, or a great number of other places. This capability would (presumably) increase their value of life and expand their choices. A person, therefore, needs both resources and the ability to use them to pursue their capabilities. This is one example of how different resources or skills can contribute to human capability. This way of looking at development, often forgotten in the immediate concern with accumulating commodities and financial wealth, is not new. Philosophers, economists and political leaders have long emphasized human well being as the purpose, or the end, of development. As Aristotle said in ancient Greece, "Wealth is evidently not the good we are seeking, for it is merely useful for the sake of something else." One measure of human development is the Human Development Index (HDI), formulated by the United Nations Development Programme. The index encompasses statistics such as life expectancy at birth, an education index (calculated using mean years of schooling and expected years of schooling), and gross national income per capita. Though this index does not capture every aspect that contributes to human capability, it is a standardized way of quantifying human capability across nations and communities. Aspects that could be left out of the calculations include incomes that are unable to be quantified, such as staying home to raise children or bartering goods/services, as well as individuals' perceptions of their own well being. Other measures of human development include the Human Poverty Index (HPI) and the Gender Empowerment Measure. It measures many aspects of development. There are six basic pillars of human development: equity,sustainability, productivity, empowerment, cooperation and security. Equity is the idea of fairness for every person, between men and women; we each have the right to an education and health care. Sustainability is the view that we all have the right to earn a living that can sustain our lives and have access to a more even distribution of goods. Productivity states the full participation of people in the process of income generation. This also means that the government needs more efficient social programs for its people. Empowerment is the freedom of the people to influence development and decisions that affect their lives. Cooperation stipulates participation and belonging to communities and groups as a means of mutual enrichment and a source of social meaning. Security offers people development opportunities freely and safely with confidence that they will not disappear suddenly in the future. In seeking that something else, human development shares a common vision with human rights. The goal is human freedom. Therefore, human development is interconnected with human rights and human freedom, because in well-managed prisons life expectancy and literacy as measured by the Human Development Index could be quite high. And in pursuing capabilities and realizing rights, this freedom is vital. People must be free to exercise their choices and to participate in decision-making that affects their lives. Human development and human rights are mutually reinforcing, helping to secure the well-being and dignity of all people, building self-respect and the respect of others. In the days of fast globalization, human rights issues surface in relation to multilateral corporations and poverty issues. The idea of human development stipulates the need for education, better conditions for work and more choices for individuals. The idea goes with human rights. The two concepts are simultaneously promoted first by good governance, implementation of human rights policy and a formation of participation of community in decision making processes, second by the promotion of civil and political rights and economic and social rights, which are components of the level of development. For instance, the right for education relates to intellectual development, and political rights relates to the level of the political development of that society. The axis of Development is that it may harm or benefit human health, and eventually human development, as it proceeds. In concern of health, we divided it into disease and poverty issues. On 16 June 2006 the World Health Organization (WHO) presented the report Preventing disease through healthy environments. No one in the world is without the environmental health issues and wealth problems. Development had been first approached as the future for more cure and hope. However, the criticism argues of the side effects such as environmental pollution and the gap between increasing wealth and poor. The Ineffectiveness of many public health policies in terms of health inequality issues and social problems should be held by global community. Therefore, the ultimate goal is to achieve environmental sustainability. Some critics say development is undermined by health concerns as it both directly and indirectly influences growth to be lower. HIV/AIDS, in addition to malaria, has negatively influenced development and increased poverty in many places, especially in Africa. Achieving adequate health standards is important for the success of development and the abolition of poverty. The Global Human Development Reports (HDR) is an annual publication released by the UNDP's Human Development Report Office and contains the Human Development Index. There is not only a global Human Development Report but there are regional and national reports as well that specifically show certain areas. Within global HDR there are four main indexes: Human Development Index, Gender-related Development Index, Gender Empowerment Measure and the Human Poverty Index. The Regional, National and subnational (for portions of countries) HDRs take various approaches, according to the strategic thinking of the individual authorship groups that craft the individual reports. The Human Development Index is a way for people and nations to see the policy flaws of regions and countries. Although the releasing of this information is believed to encourage countries to alter their policies, there is no evidence demonstrating changes nor is there any motivation for countries to do so. The Human Development Index (HDI) is the normalized measure of life expectancy, education and per capita income for countries worldwide. It is an improved standard means of measuring well-being, especially child welfare and thus human development. Although this index makes an effort to simplify human development, it is much more complex than any index or set of indicators. The 2007 report showed a small increase in world HDI in comparison with the previous year's report. This rise was fueled by a general improvement in the developing world, especially of the least developed countries group. This marked improvement at the bottom was offset with a decrease in HDI of high income countries. To reflect gaps in the Human Development Index, the United Nations came out with the Human Poverty Index (HPI) in 1997citation needed. The HPI measures the deficiencies in the three indexes of the human development index: long and healthy life, knowledge and a decent standard of living. The HPI is meant to provide a broader view of human development and is adapted to developed countries to reveal social exclusion. The Social Progress Index is published by Social Progress Imperative. It combines indicators related to social welfare, equality, personal freedom and sustainability. The United Nations made a commitment to accomplish these goals by 2015 and thus make an attempt to promote human development. ↑ United Nations Development Programme (1997). Human Development Report 1997. Human Development Report. p. 15. ISBN 978-0-19-511996-1. 1 2 3 Streeten, Paul (May 1994). "Human Development: Means and Ends". Human Development (84.2): 232–237. 1 2 3 4 5 6 7 8 "Human Development - Human Development Reports (UNDP)". 22 October 2009. ↑ Human Development and Capability Association. "Capability & Functionings: Definition & Justification". Human Development and Capability Association Briefing Note: 1–5. 1 2 Srinivasan, T.N. (May 1994). "Human Development: A New Paradigm or Reinvention of the Wheel?". 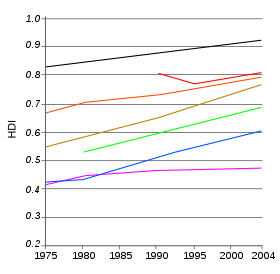 Human Development (84.2): 238–243. ↑ "The Human Development Foundation - The Human Development Concept". 22 October 2009. ↑ "Human Rights And Development: Potential integration?". Yulia Shirokova. Retrieved 3 June 2012. ↑ "Preventing disease through healthy environments: a global assessment of the burden of disease from environmental risks". World Health Organization. Retrieved 4 August 2016. ↑ Wilkinson R. (2005). "The impact of inequality: how to make sick societies" (London: Routledge;). 1 2 3 "World Health Organization- Poverty and Development". 22 October 2009. ↑ "United Nations Millennium Development Goals". 22 October 2009.